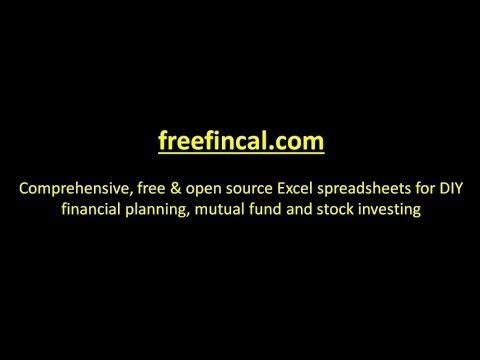 Download the freefincal robo advisory software template to plan from start to finish for retirement (early, normal, before and after), non-recurring financial goals (child education) and recurring financial goals (Holiday, appliances etc.). The template is presented in two versions – basic and advanced (the differences are explained below). The template would help anyone from ages 18 to 80 to plan for their retirement, six other non-recurring financial goals and four other recurring financial goals with a detailed cash flow summary. This is a preview published in the last post. There are nine Sheets with the following steps. A two part detailed video guide is available below. This is the end user license agreement. The user will have to agree to this upon first use. For ages 18 to 25, a simple solution is provided with no further inputs. For older users, they will be asked if they are married or not and directed to the next sheet. 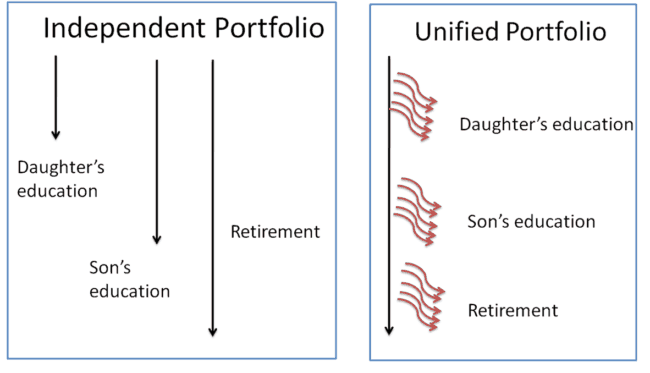 This sheet tells you the investment strategy to be adopted before retirement (and up to retirement) with clear asset allocation break up and investment portfolio management suggestions. If you are retired, you can obtain an opinion about the health of your retirement corpus. and a detailed retirement bucket investment strategy in case the corpus is good enough. 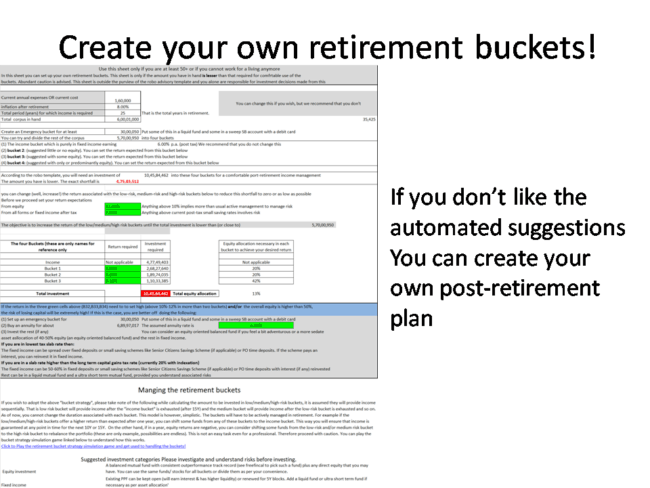 In the advanced version, you can create your own retirement buckets. You can get a complete investment strategy for one-time goals like your children’s education, a business etc. You can also plan for recurring goals like a holiday every other year, or a new car or iPhone every few years. Investment suggestions for financial goals are listed here. 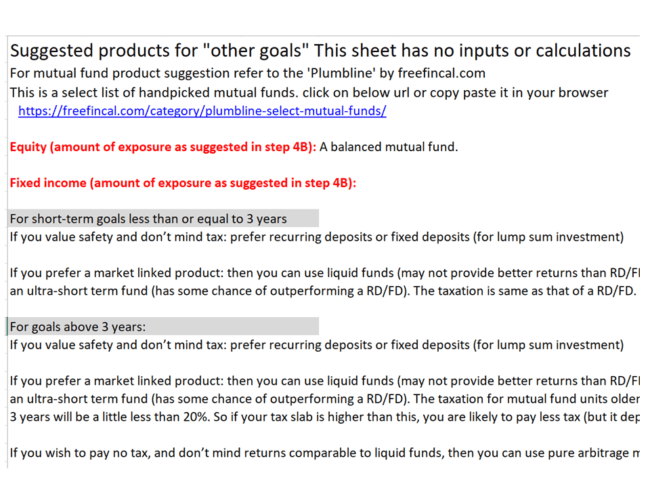 In addition, PlumbLine offers a set of mutual funds to invest. 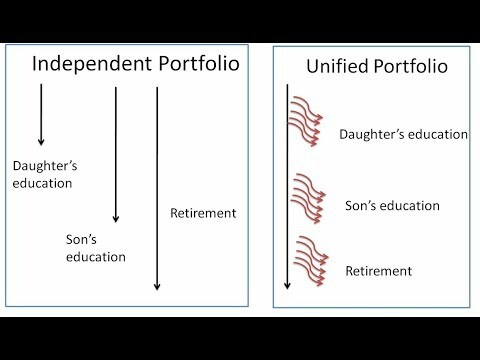 The cash flow for two different portfolio models is available in the advanced version and only the independent portfolio in the basic version. You can see the video for more details. This is a screenshot of step 6A. All settings can be freely changed. Can be used commercially proper credits. Those who have purchased the paid version will get all future updates (including this one) as well. This is an Excel file that will work on Windows and Mac. Anirban Ghosh, Anish Mohan, Dashrath Memane, Guru Rudagi, Lokesh Shah, Mahesh Bangadkar, Muthu Krishnan V, Niranjan Kaushik, Prajal Sutaria, @Prashanth_Krish (twitter handle follow him!! ), Srinivasan S R, Sajo C Mathew, Prof. Shriram R, Srinivasan Sundararajan, Sumit Nisal, Vignesh Baskar, Balaji Swaminthan. I am indebted to their time, effort, consideration and dedication. Without their help, this release would not be possible. I eagerly await your feedback about the template. Please report any bugs so that I can immediately release an update. Also, mention any additional features that you have in mind. Thanks to Amarnath Reddy for pointing out that Step 2, B24 refers to annual income and minor incorrect cell references. Both are corrected. Please add md5 file for the exe. I have done this in the post for now. BUt there maybe small bug fixes required. SO will do so once it becomes stable. Excellent work Pattu. I can see the humongous effort behind this and I appreciate the fact that this is non profit. I assume one way of paying back is by directing friends to your blog. 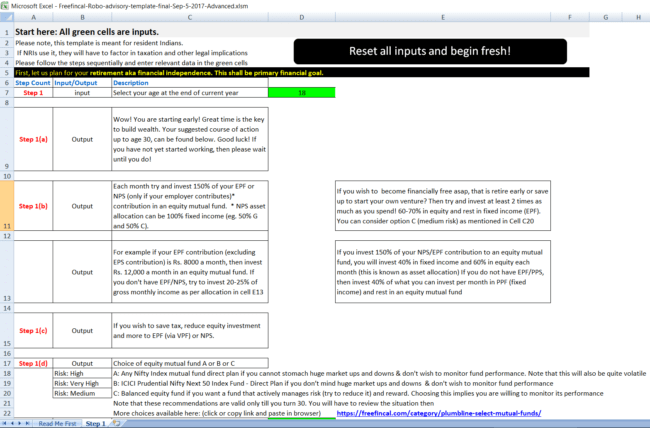 This Robo Advisory Software Template will only make it easy sell for me. This is one of your best templates and very easily understandable. I have been asked many times by my friends and family about where should they input their investments like gold and real estate. I understand gold and real estate may not be great investment options but they already hold a considerable amount towards goals like wedding and retirement. Kindly share your thoughts or redirect if you have already addressed this. Thank you so much. They can enter a notional value for gold and real estate in the current assets. Maybe gold along with fixed income and real estate along with equity (or fixed income!) as per their return perception. A bug in the Robo advisory – in Step 2 sheet.B24 column, ‘Annual pay’ is to be mentioned. The same value is taken as ‘Monthly pay’ in Step 6B.K8 column. Yes. Both refer to only pay only. Corrected yesterday. Thank you. Thank you for this tremendous piece of work. I can only imagine the amount of hard work you had put into this. Hats off to your dedication and motivation. Just my observation, i was under the impression that due to Plumbline , there would be an evaluation of risk profile as part of robo advisory. Is it beyond the scope of robo advisory template? IMO, The combination of Risk Profile+Robo Advisory+Plumbline would have been a complete package. Just my 2 cents. Once Again, Thank you for helping and guiding a novice like me. 1. 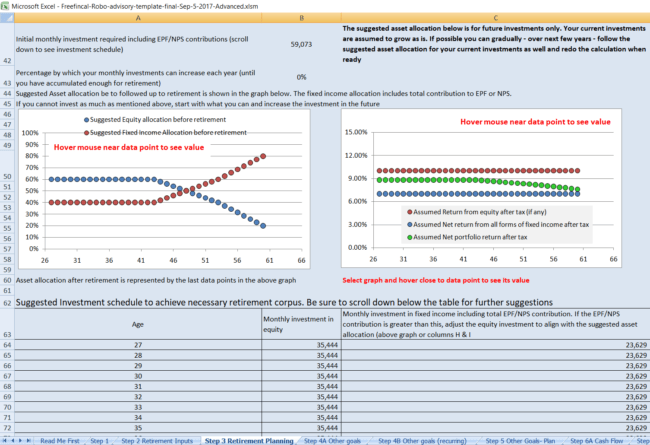 Since this template is designed for people from 18 to 80, I feel that the focus is more on the accumulation phase of retirement corpus. 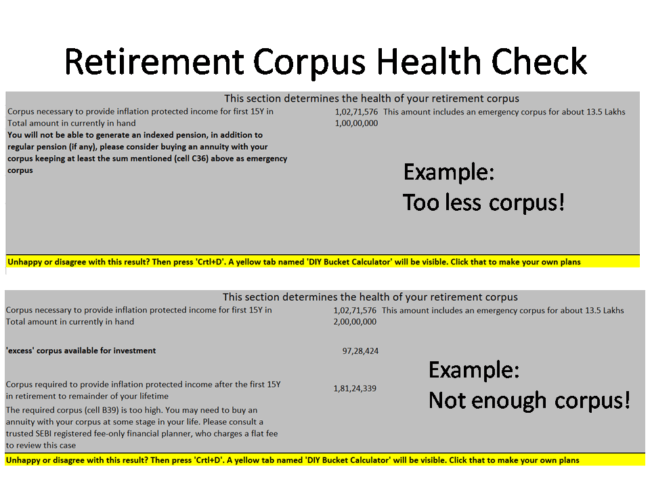 For people approaching retirement or retired, income generation strategies from the corpus will be very helpful. 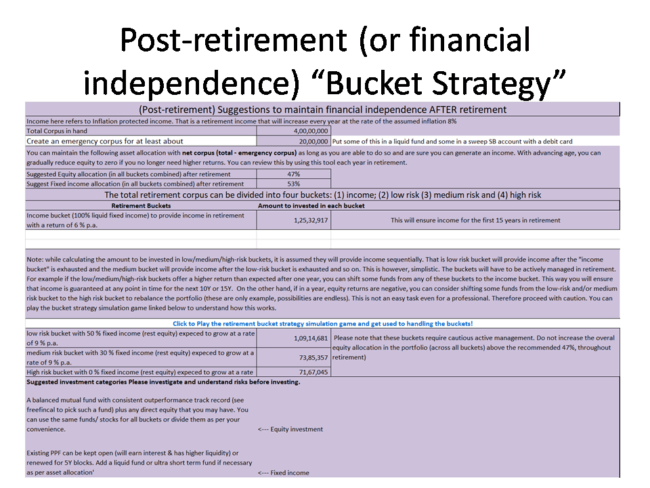 Why can’t the retirement bucket strategy be incorporated into the template. This will be especially useful for DIY investors. 2. Fixing the retirement phase till the age of the younger spouse is 90 makes it rigid (Worksheet Step 3 cell B3). This should be open to modification by users. 3. In the worksheet “Step 2 Retirement Inputs” Cell B19, monthly EPF contribution is taken which is debt portion. I suggest, monthly equity contribution (SIPs) should also be taken input. Thank you Madam.The retirement bucket strategy is implemented for all ages but not shown unless you are ready to retire. Age is fixed at 90 by design. Cannot be too flexible with a robo template. Equity sips need be an input. Since equity investment is shown, you can compare that with what you already invest. NOtional value of RE for now can be added as lump sum benefit after tax upon retirement in Step 2. Great work in building the tool. I tried the basic version of the tool ,although it looked daunting at first glance, I was able to navigate through it and fill the required numbers and and was able to come up with the final numbers in less then one hour time. Happy to say that my current planned investments matches the number suggested by the tool :). 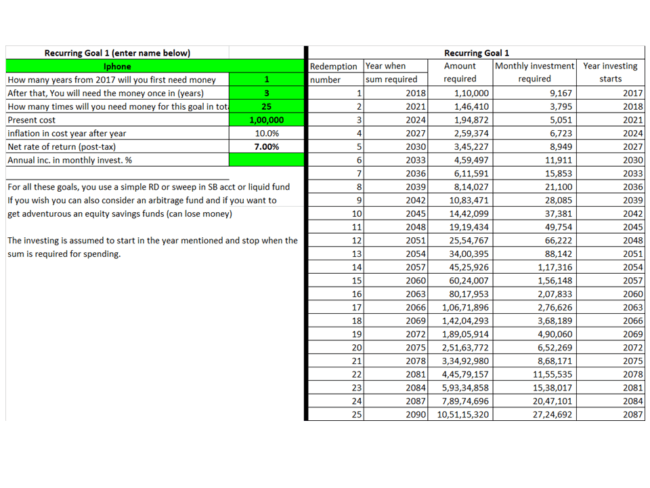 One small feedback , it will be good to have a column in the sheet “Step 6B Cash Flow” which to show the Total Monthly investment required (sum of column M and O). It will give a one final number on how much to invest. Thank you. For most people, I expect the total investment amount to be too large. Hence did not add that. 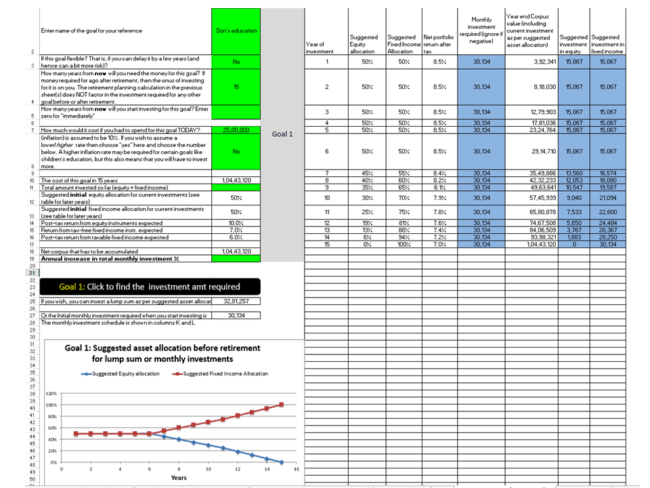 Can you add a feature to export the plan to a PDF file? Win 10 EMET is blocking this exe file from opening with a message that it is trying to make simexecflow which I understand is expected but WIN treats this is danger due to exe form. I don’t know about everyone but whoever uses genuine latest OS and genuine Microsoft Office versions could have problem as Win blocks this exe due to EMET! Can’t the excel file be locked not to make changes to it and release excel format? Exe will cause one or the other problems for latest WIN users. Can’t the excel file be locked not to make changes to it and release excel format? If only it was as simple as that! There are only three choices : 1) allow the file to run (many have); 2) purchase either the locked excel file or the open source file or 3) ignore the whole thing. EMET doesn’t allow any such individual exceptions for unverified publishers. EMET already whitelists excel, wordpad etc. It blocks exes which try to execute on a computer and if that comes from an unverified publisher. Only option is to uninstall EMET and give up security of a computer but that may be concern due to security obviously and be worry of Ransomware etc. I was curious to see the ideas and suggestions behind the Robo. But though I don’t like I’m chosing the 3rd option. after filling data in “Step 4A Other goals’ Goal 1 and clicking the Investment Requirred button the tool throws following error. The password you supplied is not correct. Verify that the CAPS LOCK key is off and be sure to use the correct capitalisation. I tried by downloading multiple time but same error. Sorry. That is not possible. In any case, I checked and I cannot reproduce the error. Hi. I have been an ardent follower of your site since last 1 year. I am really excited for this software, however I would like to know can it suggest mutual funds, and track my portfolio growth based on live data like most financial sites do? Also it would be great if it can show the exposure overlap etc. What issue are you facing? Exe blocked by anti-virus? Are you referring to password protecting Excel files like ITR utility? That can be cracked in under 3 seconds. Hello Sir, Is there a direct Excel version and not .exe version available? like a simple excel that can be downloaded? Read the post again reg how to get that. It is not available for free. I have checked the download link with Kaspersky virus desk as mentioned and it says the link is clean. However, my antivirus software ( Quick heal ) always detects the trojan viruses in both the files in the compressed format and immediately it quarantines it. Any help? Not clear Mr. Pattu sir. Please clarify. Meaning, you will have to tell your anti-virus software to treat this as valid file. If you dont want to do this, you can buy the Excel sheet. i am unable to download it boss. I have got Norton anti-virus system. Its not allowing the download. Its just summarily deleting. not even asking permission. Sir, without adding it as an exemption, it is not possible. Will mail you. I would like to buy the excel. What is the process and how to buy the excel. What is the price? I am getting this error while resizing the sheets in the tool from 160% to 100% in few sheets. That is because of the protection. Will correct it. Adding even a small annual income amount of Rs.20,000/- with yearly increase of 5% in the post-retirement income cells (Step 2, cells B32 to B41) makes a dramatic difference in the figures generated in step 3. Considering the annual income of Rs.20,000/-, I can retire now without any further corpus required but when I consider the annual income as zero I will need an additional corpus of Rs.1.6 crores for inflation protection income after first 15 years in retirement. Why is this so? Are the current annual income figures in cells B32, B36 & B40 in step 2 calculated as annual figures or monthly figures? It is annual income everywhere. And yes, it makes a huge difference – 20K annual income with 5% yoy increase is a big sum, but donr expect it to be equal the difference in corpus needed. What a stroke of luck! I may be receiving a large chunk of money soon (no, no one is dying and no, I didn’t win a lottery!) and wondering how best to invest it when I read this article and another article on fee-only planners. Excited to try this software and see the results. P.S. Is it possible for you to have a ‘Donate’ option on your website and as soon as you get enough money there (and I’m sure you will) please remove these ads on your website. There are so many download buttons of varying sizes, it is confusing. I’ve given up on quite a few articles beacuse of this. Good to know. Tried the “donate” thing. Does not work. Since my traffic has increased the ads are necessary to pay for server costs. I’m getting the same error in Step 4A in basic version. Advanced version works fine. Hi Pattu, I’m interested in obtaining the paid version of the file but could not find details about the price. I wanted to express my sincere thanks for this outstanding template. I can very well imagine the amount of effort and dedication that this work must have taken. You have made financial planning accessible and empowered many DIY investors. Hats off! I have been maintaining a very basic Financial Statement template of my own since FY08. I have been tinkering with it over the years to add some simple features. Right now, it contains a balance sheet (assets vs liabilities), financial journey chart, budget tracking, simple calculators and financial ratios (solvency ratio, debt-to-asset, etc). I can send you the template if you like. 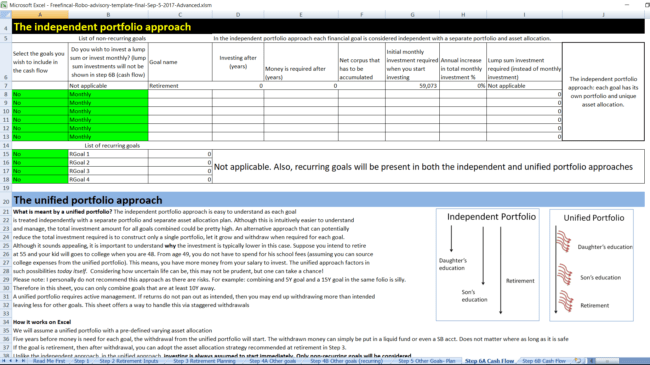 This template came at the right time for my annual review and filled a major gap of “correct” financial goal planning. I have loved all your MF calculators. But, this is your master piece. Once again, thank you! The only way I contribute back is buy your books and point my friends to the website and articles. This is a very very small return for the service. For yours is service in its true sense. Thank you so much. You made my week! I have other sheets to track assets. It will be unwieldy to include that here. Is there a way to save the file with the input I have entered? Cell B24 in step 2 pertains to Annual take home pay and the same figures reflects in step 6B. However, cell K6, K7 states monthly salary, Request you to resolve the discrepancy. I tried the Robo Advisory software. It is brilliant and I love it. I will refer my friends and family to use it. I would like to bring to your notice one issue which stumped me for sometime. I entered the data sequentially sheet by sheet. When I went to the last sheet to view cash flow, it was in red and indicated insufficient funds. 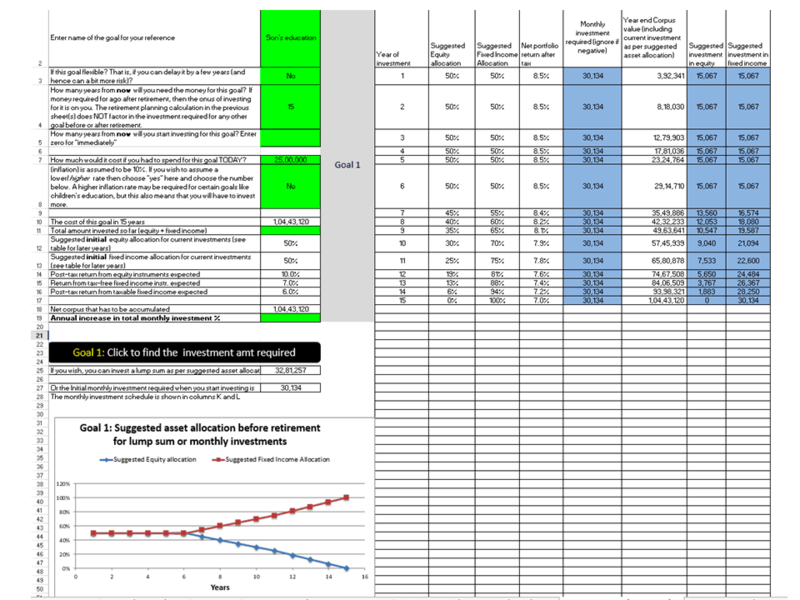 I traced back debugging the issue and then found that in the Sheet#4A, I had missed clicking the link on that sheet for ‘Click to find the investment amount required’. Only after clicking this, the amounts everywhere got updated and looked reasonable. Apparently the earlier default values of Goal were too high. Is this intentional – to wake up people into planning their retirement 😉 ?? Been following your blog regularly and the recent paisa visa podcast was great. Im a mac user and bummed that I cant use the robo excel. Guessing the only option is to buy the full version? or is there an update on this? Would be super helpful. I have the template version of year 2017. Will that be good enough to continue using it or should I go for latest paid version :)? I am not sure but the version which I have shows I need not to do any additional savings for my retirement corpus fund after I entered all the required inputs on tab 1 and 2. its very strange for me. I am confused if i did something wrong or my investments are really so good :)… For other goals surely it showing me the required investment to achieve the goal.